A P-P, or probability plot, is a type of visualization to help us visually and subjectively assess if a set of data is similar to a theoretical distribution such as normal or exponential. We can also see what data points may violate or be outside the compared distribution. I turn warnings off in this post because of an issue in Scipy that will be fixed in a later version. I set a mean of 0, a standard deviation of 10 and create 1200 data points. 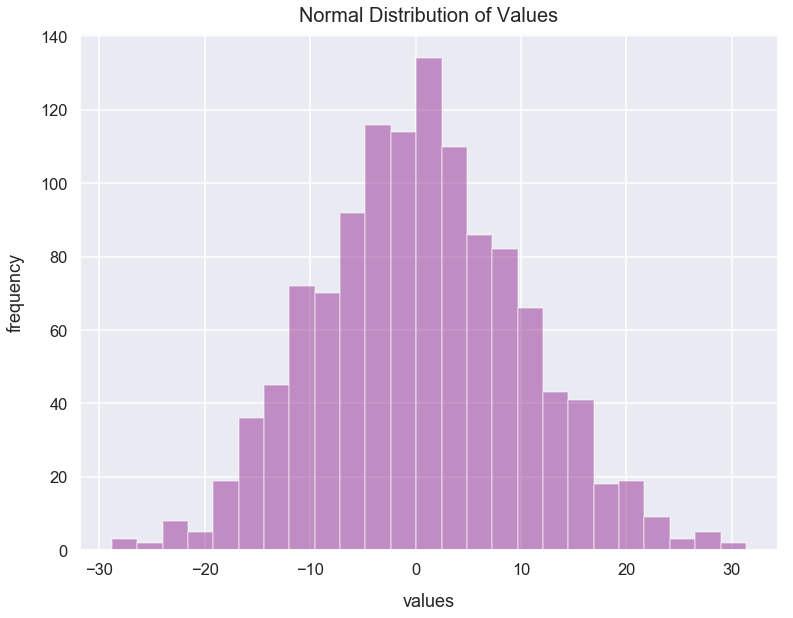 Below is a plot of a histogram of these values that resemble a normal distribution. We can visualize the first list item below. We can also calculate simple summary statistics of the median and standard deviation of normal_distr_values. Let's calculate the exact values from normal_distr_values for -3, -2, -1, 1, 2, and 3 standard deviations from the mean. 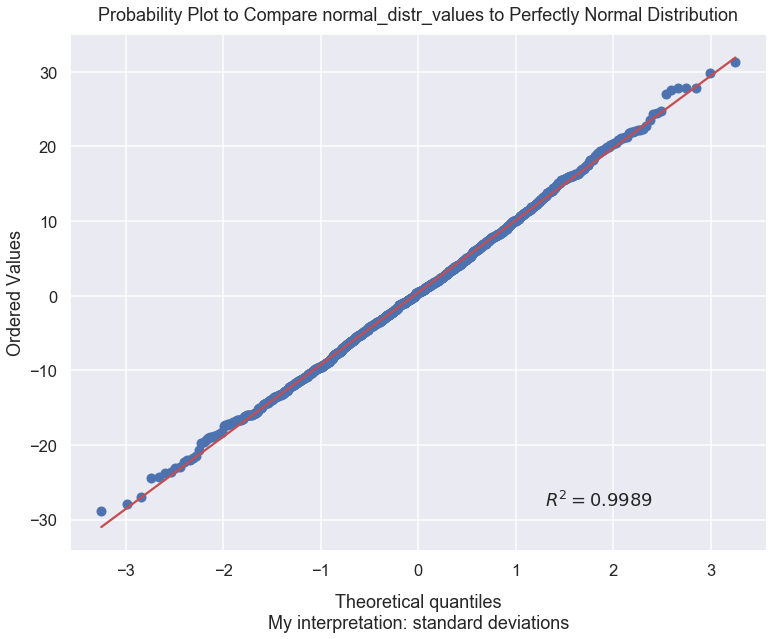 In the visualization below, our set of values, normal_distr_values is plotted against a perfectly normal distribution. Below the plot I'll explain this visualization in detail. The blue dots are the values from normal_distr_values. Here's a table that compares the standard deviations values we calculated above to coordinates of the blue dots in the plot below. I hope this helps make sense of how the blue dots were calculated. So what is the red line? Well, that's our perfect normal distribution that takes our median of normal_distr_values, 0.5, and its standard deviation of 9.7, and plots that as a perfect normal distribution. Let's add the approximate red-line ordered values for each standard deviation to our table from above. Closely compare the coordinates from the third and fourth columns of the table above! They're pretty close! Why aren't they perfect? 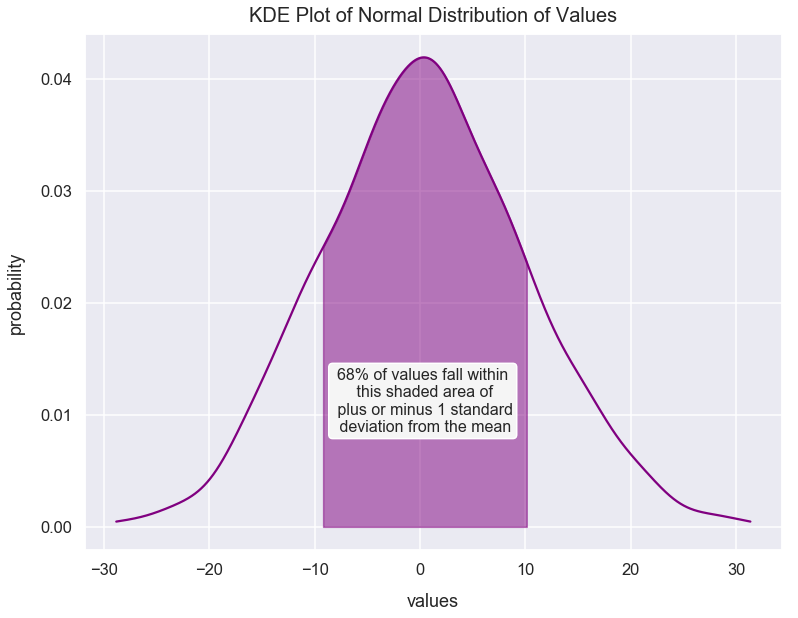 In the beginning of this article, we used the numpy package's random module and called the normal() method to create a list of values with a fairly normal distribution. However, the distribution we created wasn't perfectly normal. The way we sampled data may have caused a little variance from a perfectly normal distribution. We can see that variance because if you look closely at the plot, there are some blue dots that don't perfectly overlap with the red line. Though overall, from a visual standpoint, it looks like our normal_distr_values does resemble a fairly normal distribution. You can also use the propplot method to verify a set of values compares to other perfect distributions like uniform and exponential. You can read more about the probplot() method from the official Scipy documention page.